Who knew crafting was ‘fashionable’? I have been away a while due to hand pain and, recently, breaking my elbow. But I am feeling very guilty at my neglect and abandonment of you, dear reader, and I have made a promise to myself to try very hard to ‘get better’ at this blog writing lark. Of course, we are taught that our goals should be SMART (Specific, Measurable, Attainable, Realistic and Time constrained) – and ‘get better at’ is hardly any of those things. So, to be a bit more focused, I will try and write a blog post once a fortnight. There, that’s better. So this week’s brain snag in a crafty vein was seeing an article in ES – the magazine that comes with our regional free paper. Apparently, due to the famous British weather, the evenings can get a ‘bit nippy’ in the evenings. A designer (Alex Gore, who worked with Alexander McQueen, don’t you know) has come up with the (apparently) novel idea of using ‘fine gauge’ yarn (ok, “super-fine Hawick cashmere and Bologna yarn to be specific) to knit a lightweight but warm sweater to keep away those evening chills. The result? A “cocktail sweater”. Seriously. I’m not saying knitwear isn’t awesome – because it is and if it wasn’t my hobby would be more than a little pointless, but the ‘cocktail sweater’ being a new idea? 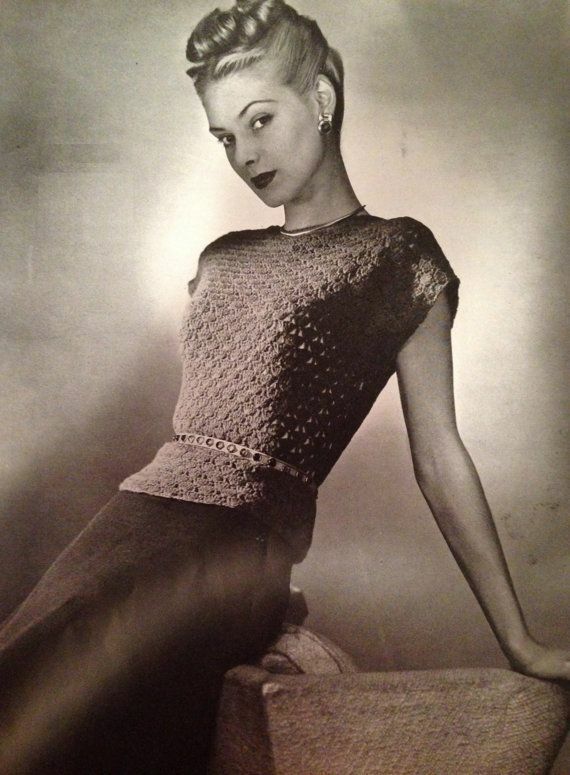 Every other page of my 1950’s pattern collection is one of these things. On the same page of the magazine there is a further celebration of Warsaw designer Magda Butrym , who showcased ‘handmade crocheted’ dresses in her catwalk this year. Wonderful. Really genuinely pleased that crochet is getting some air time – and Russian lace crochet is really, really gorgeous. But surely, given there isn’t a machine in the world that can crochet (this is a whole other post) it has to be ‘handmade’ by default? Right now, I have to continue with preparations for the course I am teaching next weekend – but I promise (as per the opening of this post) to be back soon!